Hosun Kang presents an examination of the economic policies and activity that occurred in 2007-2008 and led to the global recession. It’s the first of his projected trilogy, The Global Invisible Hand. Kang seems to be an independent researcher (no titles, designations, or university affiliations are mentioned), and he sees the 2007-2008 period as vitally important to study, not only to avoid similar calamities in the future, but because he claims the period “opened a new chapter of the world history.” Kang states his intention to use the Invisible Hand series to project the future of global finance on the basis of the past. 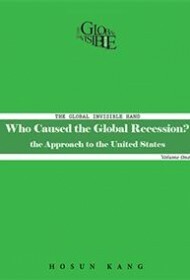 Volume One relates solely to the United States before and during the financial crisis and aims to answer the question, “Who caused the global recession in the United States?” It also functions as a historical table setter for the predictions that will likely come in later volumes. Kang offers many detailed graphics showing the historically high levels of borrowing by individuals in the U.S., and the loose lending policies of U.S. financial institutions. Kang’s book falls short, however, in its explanations of these graphics. Even chapter subheadings are unnecessarily obtuse, with simple words banished in favor of the obscure, as in “Politics and morality are immiscible.” The occasional addition of the author’s own slang (“Reduction of debt is anything but a cushy doddle”) may add to the confusion. Overall, the author’s meaning is revealed only after careful parsing of the text. Kang’s predictions of the global economy may prove valuable, but unless he corrects these writing flaws in future volumes, few readers will make the effort to discover them.